Hyannis, MA – Firefighters across Massachusetts are ready to turn up the heat and set your taste buds on fire! 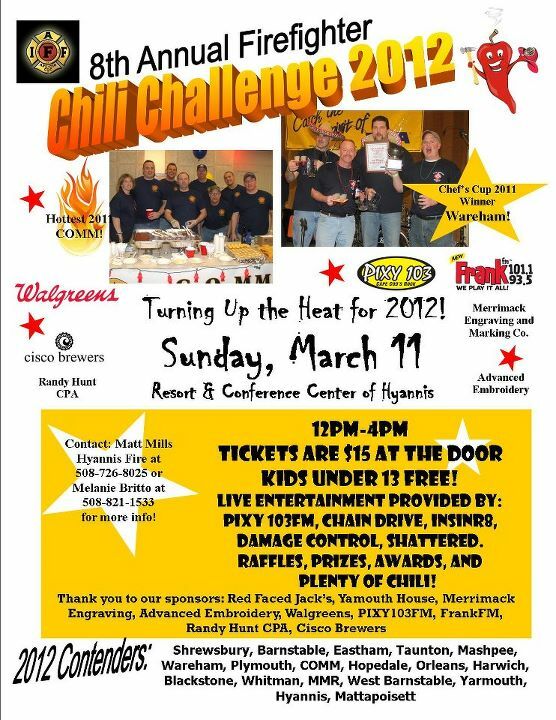 Join eighteen Massachusetts Fire Departments on Sunday, March 11th, for our 8th Annual Firefighter’s Chili Challenge! Hosted by the Resort and Conference Center, the event will benefit the local chapter of the Muscular Dystrophy Association. The event committee includes, Chris Read, Yarmouth Fire, Chris Shute, Masphee Fire, Matt Mills, Hyannis Fire, Doug Edmunds, Orleans fire and Julie Raynor from Pixy103FM. Last year the event raised over $14,000 they are looking to reach $20,000 this year! Our returning 2012 Firefighter Department contenders include: Yarmouth, Hyannis, Eastham, Shrewsbury, Blackstone, Barnstable, Taunton, Wareham, Mashpee, Plymouth, COMM, Hopedale, Orleans, Harwich, Mattapoisett, and West Barnstable. We welcome on board our new competing departments from Whitman and MMR! Teams will prepare and serve their original recipes to be judged in the following categories: Chef’s Cup, Peter Raiskio Memorial People’s Choice Award, Hottest Chili, and Best Booth Display. Awards, and bragging rights, will be given to the winning teams at the end of the event. The Chef’s cup voting will be done by a blind taste testing from our Celebrity Judge Panel which will include: Chef Louis Schorr from “The Culinary Guild of New England”, Chef Ricardo Costa, Personal Chef, Chef Laura MacDougall from “Home Plate Advantage”, Chef Sean Gualberto from “The Steakhouse and Sportsbar Hyannis”, and Chef Tommy Lyons from “The Picnic Box”. Last Year’s Awards went to Wareham Fire for Chef’s Cup, Eastham Fire for People’s Choice, COMM Fire for Hottest, and who could forget Taunton Fire taking the best booth prize for their Fire House Booth Display! The event will take place from 12:00PM until 4:00PM at the Resort and Conference Center of Hyannis on 35 Scudder Ave, across from the Melody Tent. Four bands: ChainDrive, Shattered, Damage Control and Incinr8 will perform live. Julie Raynor of PIXY103FM will broadcast from the event while Matty B emcees! The $15 general admission will include plenty of chili, voting privileges, a cash bar, great entertainment, and chances to win door prizes such as a two night stay at the Resort and Conference Center or apparel donated by Cisco Brewers! Children under thirteen years of age will be admitted for free. Eating some great food while helping a good cause is guaranteed to warm you right up this time of year! All proceeds will go to the MDA to benefit Southeastern Massachusetts families living with neuromuscular diseases. MDA is a voluntary health agency working to defeat neuromuscular diseases through worldwide research, comprehensive services, and professional and public health education. The Chili Challenge is being sponsored by PIXY 103FM, FrankFM, Yarmouth House Restaurant, Red Face Jacks, Advanced Embroidery, Perkins Paper Co., Walgreens of Mashpee, Merrimack Engraving & Marking Co. and Cisco Brewers. For more information on the event, contact Melanie Britto at 508-821-1533 or email mbritto@mdausa.org.